In my previous post, I introduced the broad concepts discussed in Research Handbook on Transitional Justice (Transitional Justice), edited by Cheryl Lawther and Luke Moffett of Queen’s University Belfast and Dov Jacobs of Leiden University and commented on some of the strengths and weaknesses of the individual chapters. In this post, I will provide my views on the debates surrounding the topic of transitional justice and outline some of the challenges in achieving transitional justice that I have witnessed through my experience working in the field in post-conflict areas. I initially found the debate in Transitional Justice on what exactly transitional justice is or is supposed to be, tediously pedantic. Is this debate important? Well, as I will explain below, yes; to embark on transitional justice without thinking of what it is meant to be in the context of where it is being pursued can be short-sighted. Though coming up with the definitive definition of transitional justice may be more of an intellectual exercise for scholars to debate, there is merit in identifying the parameters of transitional justice: what is expected to be done as part of transitional justice; what should it entail; how far, how deep, and how wide should actions associated with or identified as transitional justice be? While some, like Lawther and Moffett and the International Centre for Transitional Justice (ICTJ) – a sort of self-proclaimed authority on transitional justice – see transitional justice narrowly as judicial and non-judicial measures aimed at finding the best accountability and redress mechanisms for dealing with the legacy of mass atrocities and/or human rights abuses (i.e. the circular and unending discussion of whether to have an international(ized) court, domestic trials, a fact-finding mission, a truth and reconciliation commission, amnesties, or a reparations program), some see in a broader way. I agree with Louise Arbour that transitional justice cannot be compartmentalized and separated from broader reform – that in pursuing transitional justice, political and civil rights should not be detached from economic, social, and cultural rights. (p. 163) Put differently, how can the legacy of human (civil, political, economic, social, and cultural) rights violations be addressed without a clear, sustainable vision for a transitioning state’s future? As I see it, legal, administrative, economic, civil, and social reforms are needed in states transitioning from an authoritarian or an illiberal democratic regime to a liberal democracy. Though I have no formal academic learning on transitional justice and never had the opportunity (or need) to engage in theoretical debates on matters related to defining transitional justice, my view of transitional justice is driven by my experience in legal reform projects in a number of post-conflict areas. The debates I have been involved in were in the context of fieldwork, where I was expected to produce viable and sustainable deliverables. The debates were mostly about what sort of reforms should be adopted, as opposed to the extent to which reforms should be delineated and/or limited to neatly fit into the label of transitional justice (and as opposed to something else, such as post-conflict development, inclusive of which are reforms aimed at addressing the full spectrum of social, political, administrative, judicial, security, and economic injustices and failings). From my experience in the field in Bosnia and Herzegovina and Cambodia, a lack of coordination, coupled with the inability to adopt a cohesive long-term comprehensive and multi-faceted plan, prevailed; there were too many chefs in the kitchen, trained in different cuisines, beholden to their personal (national) preferences fuelled by ignorance, mistrust, or outright disdain for anything other than what they knew. Aside from turf-wars and empire-building by the various international organizations and NGOs, one would also have to contend with the so-called “experts” who would parachute into a post-conflict state or a state attempting to transition into a liberal democracy, promoting their cookie-cutter approach or worse yet, offering solutions based on what may work where they come from (places with stable and sophisticated political, administrative, and judicial systems; see here for an illustrative example). Factor in recalcitrant local authorities and actors who are either unwilling or unable to find the political will to embrace mechanisms for combating past human rights abuses and/or violations of international humanitarian law, and you can begin to understand the vagaries of transitional justice in action. I have never been one for labels or drawing rigid distinctions of where transitional justice ends and where, for instance, development or legal and administrative reform to foster greater access to justice begins. It may seem myopic to be indifferent to such labels, but what is the use of holding theoretical debates and engaging in analysis-paralysis, as opposed to getting the job done? From my own experiences, I have come to conclude that no reform is sustainable unless a holistic approach is taken. You cannot simply address systemic problems in isolation or even sequentially (assuming you can identify a hierarchy). Generally, there is no single tripwire that sets off a series of events that results in human rights abuses, loss of the rule of law, an impaired judicial system, unlawful evictions and land-grabbing, inhumane working conditions, etc. This is something that builds up over an extensive period of time. Recently, I posted on the expert report commissioned by the Advisory Commission on Rakhine State (ACRS) chaired by former United Nations (UN) Secretary General Kofi A. Annan. The ACRS’s holistic approach to addressing the Rakhine issue superbly furthers Arbour’s point that transitional justice cannot be compartmentalized and detached from broader reform aimed at addressing the full spectrum of civil, political, economic, social, and cultural rights – a point which I share. In the area of economic and social development, the ACRS recommended, for instance, increasing the participation of local Rakhine communities in decision-making, conducting labor market assessments, investing in infrastructure, promoting small businesses, and so on. These recommendations obviously fall into the category of state development. Some of them may seem merely incidental to stopping the ongoing atrocities and finding a peaceful resolution. I beg to differ. Tackling impunity, racial and ethnic inequality, religious intolerance, civil and political disenfranchisement, insecurity, poverty, etc. – all of which are feeding into the ongoing human rights violations against the Rohingya – requires a holistic approach. These issues, in no small measure, are interconnected and relevant to the Rohingya humanitarian crisis. If there is to be any sustainable peace, all these issues must be tackled simultaneously. Prioritization is often the rub. Funds for transitional justice are limited. Public interest and donor generosity are in short supply. With transitional reforms being a messy, arduous, and variable process, having a clear idea of what transitional justice is meant to be (and whether it should be separate and distinct from civil society reforms and development aimed at fostering peace and reconciliation and addressing gender inequality, access to justice, labor rights, judicial and administrative reform, etc.) in the context of the state involved, is essential. Put differently, what transitional justice entails is a consequential concept, delineated by circumstances. The fundamental question that begs an answer is whether transitional justice only concerns the redress of past criminal wrongdoings, or whether it also involves addressing other human rights violations. My take is that transitional justice – however defined – must be bundled with multifaceted development. Of course, there will always be limits on resources, time, etc. And of course, there will always be the need to prioritize the essential undertakings. 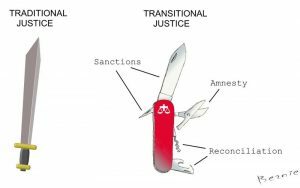 Any harm in approaching transitional justice from a broader perspective is far outweighed by the risks of compartmentalizing it to fit some neat and narrow definition that stunts the scope of efforts taken in areas undergoing transition.